1. Which layer of the OSI model is responsible for specifying the encapsulation method used for specific types of media? 2.Which statement describes signaling at the physical layer? Sending the signals asynchronously means that they are transmitted without a clock signal. Signaling is a method of converting a stream of data into a predefined code. Wireless encoding includes sending a series of clicks to delimit the frames. In signaling, a 1 always represents voltage and a 0 always represents the absence of voltage. 4.The throughput of a FastEthernet network is 80 Mb/s. The traffic overhead for establishing sessions, acknowledgments, and encapsulation is 15 Mb/s for the same time period. What is the goodput for this network? 6.How is the magnetic field cancellation effect enhanced in UTP cables? The jack used is an RJ-11 connector instead of an RJ-45 connector. The cable is not shielded. 9.Which statement is correct about multimode fiber? SC-SC patch cords are used with multimode fiber cables. Multimode fiber commonly uses a laser as a light source. Multimode fiber cables carry signals from multiple connected sending devices. 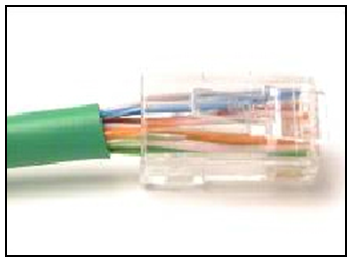 SC-ST patch cords are used with multimode fiber cables. 10.What is one advantage of using fiber optic cabling rather than copper cabling? 11.Why are two strands of fiber used for a single fiber optic connection? 13.A network administrator is required to upgrade wireless access to end users in a building. To provide data rates up to 1.3 Gb/s and still be backward compatible with older devices, which wireless standard should be implemented? 14.What is one main characteristic of the data link layer? It shields the upper layer protocol from being aware of the physical medium to be used in the communication. It converts a stream of data bits into a predefined code. It accepts Layer 3 packets and decides the path by which to forward a frame to a host on a remote network. It generates the electrical or optical signals that represent the 1 and 0 on the media. 15.As data travels on the media in a stream of 1s and 0s how does a receiving node identify the beginning and end of a frame? 16.What is true concerning physical and logical topologies? Logical topologies determine the media access control method used. Collisions can exist in the networks. Stations can transmit at any time. 18.What is the purpose of the FCS field in a frame? 19.Fill in the blank with a number. 10,000,000,000 b/s can also be written as _____ Gb/s. 20.Fill in the blank. The term _______ indicates the capacity of a medium to carry data and it is typically measured in kilobits per second (kb/s) or megabits per second (Mb/s). 21.Fill in the blank. What acronym is used to reference the data link sublayer that identifies the network layer protocol encapsulated in the frame? 22.The physical layer encodes the frames and creates the signals that represent the bits. These signals are then sent on the media one at a time. The destination node physical layer retrieves the individual signals from the media, restores them to their bit representations passes the bits up to the data link layer as a complete frame. Match the steps to the physical layer operations that occur when data is sent from one node and received at another node. Publicado por El Guille en 7/14/2015 11:31:00 a. m.